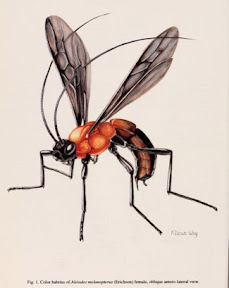 I've been taking advantage of the Biodiversity Heritage Library's archive of the Journal of Hymenoptera Research lately, and I think it's worth reminding everyone that every issue from volumes 1-16 (1992-2007) is up there. You can download each issue as a PDF, and you can search/select text. There are some real gems in there! The image above, which is an illustration of Aleiodes melanopterus (Erichson), can be found on page 266 in volume 1, issue 1.